You may have noticed an increase in food posts lately, and that should come as no surprise because I love food. Ever since I was a child, food has always been something I've enjoyed and as I've grown up, it's been something that is important and a key part of my life. 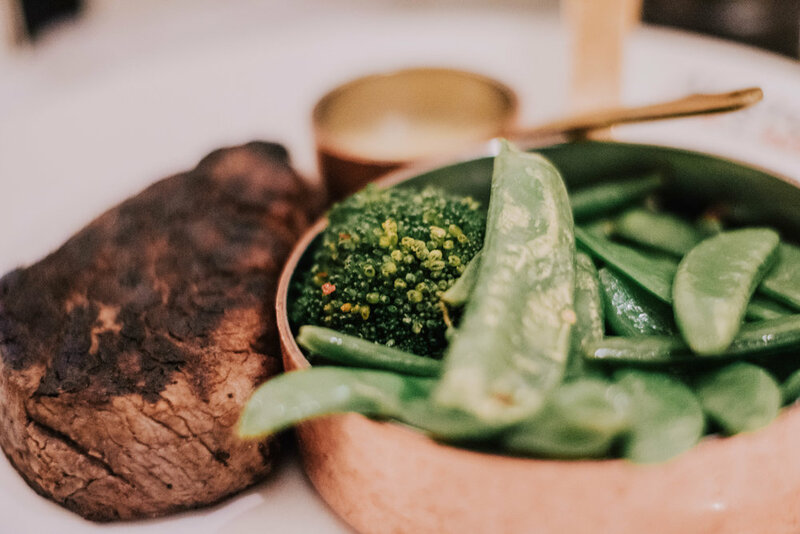 So when I was invited by Alston Bar & Beef in Manchester to discover their new restaurant and try out their menu, it was a no-brainer - and was probably one of the best steaks I've ever eaten. The restaurant is part of the Corn Exchange, but can only be entered off Cathedral Gardens, which gives a nice separation and means it's a bit off the beaten track! We started the evening with drinks, and I tried the homemade Wild Berry, Hibiscus and Chai Gin Liqueur with an elderflower tonic water. It was very much unlike any other gins that I've tried and was nice to try something different! It really did take on the flavour of the wild berry and had notes of cinnamon from the chai. Like father like daughter, my dad is a massive fan of steak, so I brought him along as my plus one. We both went for three courses and actually opted for slightly different choices so we really got to try a good amount of the menu! My dad opted for the Smoked Chicken Rillettes and I went for the Roast Scallops. The Smoked Chicken was served in a way that was reminiscent of a deconstructed Caesar salad and was really flavourful and of course, presented beautifully. The Roast Scallops were also delicious and were served with a black pudding crumb and prosciutto of which the saltiness really worked with the delicate flavour of the scallops. I'm not normally a fan of black pudding, but as it was in crumb form, it had a far gentler texture so was not as imposing! The dish was served with a garden pea vinegarette which cut through the richness and pulled the dish together. For mains, it was only fair that we went for a steak (especially as the restaurant claims to have the best steak in Manchester!) And we both thoroughly enjoyed it. We both went for the 230g Fillet steak with vegetables in a chilli butter sauce for myself, whilst my dad went for chips. The steak was incredible - it was cooked perfectly medium and just melted in your mouth. I ordered mine with Garlic & Herb butter but in all honesty, it didn't need a sauce as it was packed full of flavour and had some sort of herb coating which I couldn't quite put my finger on! The vegetables were so yummy - but isn't anything drenched in butter? My dad paired his steak and chips with the Brisket Mac & Cheese and it's safe to say, he was in heaven! The mac and cheese was so flavourful and not cloying, and the brisket was delicious - my dad boldly stated that it was the best mac and cheese he'd ever had which says a lot! By the time we reached dessert, we were pretty full but were so taken in by the menu that we couldn't say no! I went for the Hazelnut Brownie and my dad went for what was essentially a rhubarb and strawberry Eton mess! The brownie was incredible. It was served warm and was perfectly gooey, and came with a chocolate sauce that was essentially just melted chocolate. 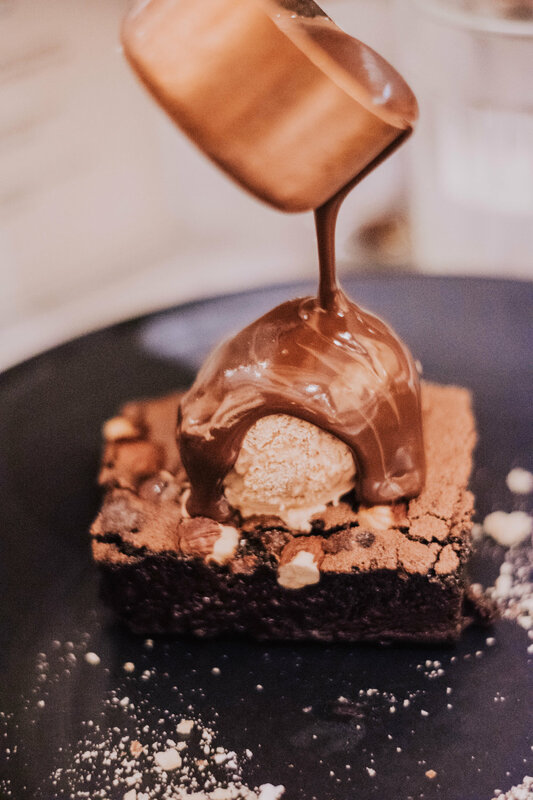 It was topped with a scoop of toffee ice cream which was a nice change from vanilla and went really nicely with the brownie. My dad really enjoyed his eton mess type desert - the rhubarb was the perfect combination of sweet and tart - which combined with the meringue was the perfect summer pudding! The restaurant itself is aesthetically stunning - we walked through their cosy 1837 bar into the main part of the restaurant and were surprised at how large it was! The decor was very modern yet luxurious - plenty of marble! It had a lovely ambience and we settled in right away! We left feeling very full and very much enjoyed the evening! The food was brilliant and I've already recommended it to all my friends! If you like beef or steaks, I would definitely suggest booking a table as it's totally worth it and would make the perfect evening. Have you been to Alston Bar & Beef? Does this sound like somewhere you'd like to visit?